There are certain things that define a generation. The music they listen to, the shows they watch, the technology they use, the values they hold and their approach to health, all make up their generational zeitgeist. The current over 60s generation are the baby boomers. Following World War II, this generation was born between the 1940s and mid-1960s and have watched the modern era of technology develop as adults. Baby boomers are a generation known for being raised during difficult circumstances post-war and then ultimately benefitting from a time of increased affluence, higher levels of income than their parents and a more consumer-focused culture. Thanks to modern innovation, people are living longer than ever before, and in 2016, 20.4% of the UK’s population was aged 65 and over, with this number predicted to rise. This means by the time millennials (born between the 1980s and the 1990s) reach their 60s, they are more likely to live longer than ever before. This generation is known for being severely impacted by the recession and the unemployment it caused. Often regarded in modern press as opposing generations, the terms ‘baby boomer’ and ‘millennial’ are often used to summarise the pitfalls of a generation by media. But, in 2050, when over 60s are all millennials, what will the landscape of this generation look like? How much of an effect can a cultural zeitgeist have on a generation, and will those effects cause future over 60s to behave in a wildly different way from current seniors? This article looks at what can be expected from future over 60s, breaking things down into a number of different topics. Click a question in the below contents to explore more. What is the future of health? What values and attitudes can be expected? Fashion has always been and will likely always be a big part of millennials’ personal self-expression. What people choose to put on each morning can tell you a lot about them. As a constantly changing and fluid trend, fashion choice can be a very unique topic for everyone. Some people choose to dress more practically, whereas others may choose to express their interests through their wardrobe choices. With fashion being so particular to the individual, how might it change in future years? What will people be wearing in the future? Time and time again in the fashion industry, culture has seen style loop back around. Usually described as ‘unexpected comebacks’, the world has seen over time that as people grow older, they then look towards the trends they loved when they were younger. Currently, people are picking up styles from the 90s and early 00s that many people thought had been pushed to the back of the fashion world’s minds. This throwback, nostalgic form of dressing is something all generations do, but maybe none more than millennials. In the future, the world has to wonder whether these 90s and 00s ‘vintage’ trends will live on, or whether in 2050 everyone will be trying to dress like the 2020s again. Something that is bound to have a large effect on the fashion industry is smart mirrors. Relatively new in the UK, smart mirrors are starting to take off around the world. These mirrors, with a built-in screen, are able to feed you information, digitally try on new clothes, makeup or hairstyles and even advise you on what to wear. As well as helping with fashion choices they are also able to show you live news updates, weather reports and more. Think of them as a large, reflective smartphone. The technology continues to advance, and as it becomes more popular it’ll start showing up in more places. For now, smart mirrors are mainly being used in retail stores to show products to customers, however, if they were to come into homes, they could have a massive impact on how people choose to dress. Entertainment is a large part of modern-day culture. People talk about what happened on TV last night with friends, family and work colleagues. People have parties to watch season finales. People re-watch favourite shows over and over again because they make them laugh or make them cry. With entertainment being such a big part of culture, what does its future look like? How will people consume their entertainment? Over the past 50 years, entertainment has evolved massively. Society has gone from being limited to a strict schedule of programmes on a handful of grainy channels to having a world of choice literally at its fingertips in high definition. Thanks to streaming platforms, the large range of channels available, and catch-up TV, it’s now incredibly easy to be able to watch whatever you want, whenever you want. It’s not just traditional types of entertainment that are increasingly popular. YouTube, an online video platform, is an incredibly popular way for people to entertain themselves. A report published by Google in 2016 said that “in an average month, 8 out of 10 18- to 49-year-olds watch YouTube”. And it’s not just under 50s using the streaming platform, either. In fact, it can already be seen that the older generation are using social media for pleasure. In January 2019, Google announced that it found that 68% of baby boomers watch YouTube videos for entertainment. With technology progressing at faster and faster rates, it’s hard to say exactly how people will be consuming entertainment in thirty years’ time. However, VR is something that is bound to play a bigger role in life, moving beyond a device to consume video games and becoming a way to experience films, TV, and simulated experiences in a truly immersive way. How will social media shape the future over 60s? Loneliness is something that is affecting current older generations dramatically. A recent Which? report states that 75% of people aged over 75 live alone, and one in 10 people aged 65 or over say they always, or often, feel lonely. Being described as an epidemic, many charities are attempting to fix this issue. In March 2018 volunteers at The Silver Line took 48,070 calls from lonely or isolated people, a number that is 24% higher than March 2017, with 53% of those callers claiming they have no one else to talk to. This may not seem like an issue that relates to social media, but recent research published by The Journals of Gerontology have found that, for older people restricted in their social activity by pain, social media can supplement offline social participation and buffer the detrimental effects of isolation. With the millennial generation being the first generation of true digital natives, and their social interactions already taking place on social media as well as in real life, this could mean they are preconditioned to stay in touch more readily and will reap the benefits of online communication when they are in their older years. Holly Brockwell is the founder of Gadgette, a site curated for “geeky women and their friends”, she spoke about how she thinks the web and social media will affect the loneliness epidemic: “Millennials have got used to finding their tribe on the web and social media. I don't see that changing as they age – they'll find new interests, and those interests will come with their own online social groups. Whether an ageing millennial decides to get into veganism, knitting or wakeboarding, they'll find a ready-made social group to talk to about it. “We've already seen this with the huge influx of parenting content online – as millennials have got older and started to have kids, they've naturally continued their behaviour of blogging and posting about it. Parenting forums, apps, WhatsApp groups and subreddits are full of people who had no idea about kids five years ago, and now help newbies they'll probably never meet get to grips with their new role. Holly also spoke about what she thinks the landscape of social media will look like in the future: “In my experience, people have a particular social media platform that suits them – and those that don't find theirs often go away and build it! That means in the future we'll probably have a wider choice of platforms than we have now, and people will gravitate towards the one that feels most like home. What will entertainment look like in the future? The nature of entertainment is ever changing and evolving, depending on a whole range of factors. The millennial generation has been at the forefront of some of the media’s largest events in recent times, which will almost certainly affect what entertainment will look like in the future. The #MeToo movement has been an unavoidable force shaping modern day entertainment. Becoming ‘viral’ in 2017, the movement saw high profile celebrities speak out against sexual assault in the entertainment industry. This movement has changed the landscape of the industry and has led way to people calling for the people they see on their screens to be held accountable for their actions. On top of this, the popularity of platforms like YouTube and Twitch mean that people are becoming more accustomed to lower-budget, more personal entertainment. Reality TV continues to thrive, with shows like Love Island pulling in 3.6million live viewers for its season finale in 2018. Although not labelled as such, the intimacy and autonomy that YouTube provides to its creators often mean that the media posted here can also be described as a form of reality entertainment. With so many channels for entertainment, you can argue that in the future the landscape of media can be broad. There is enough room for everyone to operate, and for people to be able to find exactly what they want to watch. However, events like the #MeToo movement, and the popularity of platforms like YouTube will definitely help shape the future of video. Technology is such a broad term. Once meaning only incredibly advanced products, people are now surrounded by technology. People have phones that can do everything, speakers that can be talked to and homes that know when to heat themselves. With all of this happening now, it’s hard to try and fathom what technology will look like in 2050, or how it will affect that generation of older people. Just think about technology in the 1980s compared to today. It’s a staggering jump, especially in the realm of mobile phones, TVs, and computers. What will growing up with technology mean for future over 60s? Millennials are the first generation of so-called digital natives, which has had a big impact on how they interact with technology, as opposed to older generations who have had to learn everything from scratch. For millennials, technology has always been around, and it doesn’t take long for them to get to grips with a new device or software compared to their older counterparts. Currently, older people are stereotypically viewed by the general public as somewhat unsure of technology. This is by no means true and in 2050, this will certainly not be the case. Although that older generation may not be as savvy with brand new systems coming out, they are going to be much more accustomed to technology and its inner workings. This is sure to have an impact on how future seniors interact with technology and implement it into their everyday lives. “Being a millennial myself, I know how our generation has grown up surrounded by technology. We've witnessed the birth and rapid advancement of the internet, wireless technology and many other hugely influential innovations. Because of this, and unlike the baby boomer generation who did not grow up around digital technology, I think we'll be well-placed to keep up with advancements. What modern technologies will change older people’s lives dramatically? Wearable technology is another new innovation that is already making a significant difference to the lives of older people. Items like smartwatches are able to not only track fitness, but vital readings like heart rate and blood pressure. These two signs are major indicators of ill-health and the tech which monitors them is already saving people’s lives. If it is presently having a life-saving impact, the future of wearable technology can only continue to help people in new ways. As society advances, it is likely these items will be able to not only read people’s vitals in a more advanced way but also be able to track other signs that could save lives. The future of this technology is quite startling to ponder. Miles from TechSilver agrees that this kind of tech will play a big role in people’s lives but also offers an important caveat about what the future might hold: “Everything in our lives is rapidly becoming interconnected, from our heating system to our cars, and our security alarms to our speakers. One of the biggest innovations that's helped this happen is the ability to put a sim card in just about anything, enabling them to constantly transmit data. Whereas previously we relied upon anything 'connected' to be physically wired in, advancements along with improved battery technology mean we can connect wirelessly from just about anything. “Aside from general fitness wearables and apps, there is also an increase in the use of specific health requirement monitoring; more common in older age groups. This is the larger opportunity in healthcare – medical grade devices for end-users to monitor and treat or rehabilitate chronic disease and other conditions. ActionSense is a perfect example of this where the glove was designed to rehabilitate and monitor stiffness in finger joints for patients with Rheumatoid Arthritis, post-stroke patients with reduced mobility or post-hand surgery to assess hand mobility. Although they seem like a fantasy of the future, driverless cars are currently being trialled all around the world. Some experts believe that by 2030 there will be 27 million driverless cars in Europe alone. Reading the environment around them, these autonomous vehicles can take over driving and let everyone in the car become a passenger. With faster reactions than humans, no risk of getting tired, and passenger wellbeing at the forefront of production, it’s thought these cars could make a staggering difference to road safety. In fact, research conducted in America predicted that driverless cars could reduce traffic fatalities by up to 90% by 2050. If the tech truly comes to fruition, autonomous vehicles could change the transport world as it is known today. As well as saving lives and preventing injuries caused by traffic accidents, time spent behind the wheel will now become free time, so people will have to reimagine how they spend it. Driverless cars will also liberate older people like never before. No longer will people, who are unable to drive due to poor eyesight and other ageing factors be isolated or forced to rely on public transport. These future over 60s will have the freedom to travel near and far from the comfort of their own vehicle with safety the concern of a bygone era. When it comes to people’s homes, the future is already here in many respects with more and more people utilising smart appliances to add convenience to their lives. 25% of UK consumers own at least one smart home device and there is no reason to suggest that this trend won’t continue upwards, with items like smart fridges – which can sense what products are stored inside, look up recipes, and leaves messages for family members – becoming more and more prevalent in society. Going beyond fridges, people are likely to see their entire homes becoming further imbued with technology and artificial intelligence, helping to make life easier for millions of people. From security to entertainment, the possibilities are endless. While some of this technology is already emerging, in thirty years’ time, such things will have advanced tremendously and proliferate widely thanks to the lower costs that can be expected from rising demands and more competitors breaking into this budding market. There is a great range of useful apps and websites for older people that can help in almost every aspect of life, but one really has to use their imagination to think about what apps might be available in the future. Human beings are becoming more connected with technology, so one can presume that in thirty or forty years’ time, apps will have moved away from phones and TVs and become a part of the human body, thanks to wearable technology and even bodily enhancements. Society could perhaps see language apps that allow people to master foreign tongues without ever having to learn a word, speech simply translated at the moment it is spoken – as a result, divisions and barriers between peoples will become a thing of the past. Apps are likely to make their way to the world of VR too, allowing people to contact friends and family not just on a computer screen with apps like Skype but to actually see people standing in front of them in a virtual world. And then, of course, there are the myriad entertainment apps that would be available on such devices, as well as virtual tourism apps, taking individuals across the world virtually without ever leaving the house. Not only does this impact the number of older adults around but it also impacts things like retirement. If humans are living past 90 years old, it only makes sense for future generations to be working longer. With medicine and technology not only prolonging life but increasing the quality of it, these future older people will be enjoying themselves and remaining active beyond what the present world is used to. How will older people be exercising in the future? With the possibility of older adults being able to stay more active, what does the future of exercise look like? Will millennials even need to physically exercise with implants, nanomachines, and other futuristic tech optimising their bodies for them? It’s hard to say but it seems unlikely that exercise will go completely out of the window, especially for those who enjoy it and want to reach new levels of fitness and strength. So, what kind of exercise equipment could be on the horizon? Well, instead of attaching weights and resistance to the human body for things like pull-ups, how about playing with gravity instead? It’s not out of the realms of possibility that future generations could be stepping into technologically advanced rooms where the gravity can be manipulated to increase or decrease resistance. The world could also see the implementation of exercise suits that allow the wearer to exercise for longer periods of time. These suits could theoretically measure body fat, lactic acid build up, supply oxygen-rich air, and cool the body to prevent perspiration. The possibilities are endless, and it will be truly interesting to see what the world’s brightest minds are able to deliver in the realm of fitness and exercise. What will accessibility look like in the future? One thing that many older people currently have to consider when going about their daily lives is the topic of accessibility. Unfortunately, not everyone retains the mobility they once enjoyed earlier in life, with a number of people having to rely on stairlifts at home and other mobility aids to retain their independence. Accessibility, of course, also plays a part outside of the home. Some people needing to consider how accessible a location is before they can even consider visiting with friends or family. Fortunately, accessibility is trending in a positive direction, with more and more businesses, attractions, restaurants and more becoming friendly to those with mobility issues. If things continue in this direction, the UK should become an even more accessible place for future generations of older people, allowing them to remain independent for longer and enjoy a better quality of life. The Papworth Trust has found that, as of 2018, 75% of trains are considered accessible to disabled people, with 25% of London Tube stations also being accessible. In the decades to come, you have to hope that such numbers will rise even higher towards 100%. The Papworth report also found that 44% of stairs, corridors, and doors are too narrow and 23% of elevators are inadequate. When it comes to attractions, apparently 68% of disabled adults have experienced a barrier visiting a museum and ¾ have left a shop because of accessibility issues. This has an impact on quality of life and how enthusiastic those with limited mobility are about engaging with the community. There’s so much room to grow and hopefully with a concerted effort, future over 60s will be coming across very rare barriers to the things that they can enjoy. What will people be eating in the future? With more and more people becoming aware of where their food comes from, and, as a result deciding that slaughtered meat isn’t for them, it seems possible that a big move away from traditional sources of meat might occur in the decades to come. Right now, there are many professionals hard at work on producing what is called ‘clean meat’ or ‘cultured meat’, which is produced by taking animal cells and replicating them outside the animal, resulting in 100% real meat but without any of the drawbacks sometimes associated with factory farming and slaughterhouses. If clean meat should become prevalent in the future, this will obviously have a big impact on the world and the life of the future over 60s. Matt Ball from The Good Food Institute – which works to make clean meat and plant-based meat alternatives a reality for all – says that they believe people will someday embrace clean meat and spoke about what the near future holds: “At GFI, we're agnostic as to how clean meat will evolve in the future market relative to plant-based meat. Both are more efficient and sustainable and will be preferable to slaughter meat. When it comes to the future of over 60s and food/nutrition, there’s a lot to be said about how the foods that people are eating now will affect a person’s weight in the coming years, which brings along with-it concomitant health issues that society will do well to avoid. This is an area that The Food Foundation is passionate about tackling, spreading awareness on the dangers of unhealthy eating and what it might do to future UK citizens. The Food Foundation also produced the above graphic with the report to give the public a sense of the future that awaits them, depicting the projection of people being born now and what might happen when they are 65. Less easy to measure than other elements, a generation’s values and attitudes can control the rest of their lives in myriad ways. What they prioritise and what they believe can have an outstanding effect on their actions, and what path their life takes. How have circumstances affected millennial’s outlook on life? As with every generation, the circumstances affecting them can shape their outlook for life, especially the circumstances that occur in their younger years. The baby boomer generation was impacted by cheap housing, an explosion of anti-establishment culture including rock and roll, and a new spirit of positivity after the Second World War. For millennials, there have been other defining cultural circumstances. ‘The War on Terror’ has certainly had a large effect. As well as that, growing up in ‘The Great Recession’ has prepared this generation for the reality that they will have to work hard to earn a career, and with less disposable income alongside a fluctuating and weak housing market to contend with, the motivation is high. The environmental-awareness millennials have is a large part of their thought process. As well as high-levels of veganism, there can be seen a call for reusable products, less single-use plastics and where possible, recycled products. In fact, a study conducted in 2018 found that worldwide, 73% of millennials are willing to pay extra for sustainable products. A figure that has increased a lot since 2014, when only 50% agreed with the statement. This is something that likely will not go away, as stories of climate change continue to make the headlines, millennials are attempting to fight it in any way they can and will probably do so for the rest of their lives. So, although owning a house may be a dream for millennials, the chances of it happening when they are young is looking increasingly unlikely. This pushes housing priorities in one of two directions and for the average millennial means, this generation will either heavily prioritise saving or will instead have to accept a fate of renting. Tanya, a leading millennial career and workplace blogger at Lucky Attitude, spoke about how she can see millennials approach to housing affecting the future: “Young adults today have different priorities. The 20s and early 30s are all about self-discovery, careers and working towards financial independence, instead of settling down, getting married and having kids. Millennials are delaying major life milestones, which also means we are delaying the need to buy a property by the age of 30. “This, however, doesn’t mean that majority don’t want to own their place eventually, they do, it’s just that they are not rushing it. Considering the obscene house prices in the last 10 years, I can’t see why we should blindly be rushing to get onto the property ladder without understating why we are doing it first. As Tanya said, a lot of people are delaying more traditional milestones in favour of self-improvement and career goals. This means, that it’s been found that all around the world millennials are having fewer babies than their previous counterparts. In America especially there has been a large decline in births. Theories are one of two things, either women are forgoing having children all together, or they are simply just waiting for the right time. As Tanya said, people are pushing these milestones so they are able to give themselves a strong foundation first, so it is possible that the world will see a large influx of births when all millennials reach their 30s and 40s. There are some truly inspirational over 60s in the public eye today, setting the bar for what’s possible in one’s golden years. Read on to discover a few of these very individuals and try out the below flip cards, presenting an inspirational over 60 on one side and their potential 2050 counterpart (a younger public figure who could go on to become an inspirational over 60) on the other. Bill Gates is one of the most famous people in the world and has revolutionised myriad aspects of daily life thanks to his work as the founder of Microsoft. The world has changed radically for the better thanks to Gates but it’s not just his success and influence that causes him to be an inspiration to many. At 63 years old, Bill Gates, since retiring from Microsoft, has gone onto pursue philanthropic endeavours, donating vast amounts of his wealth to an assortment of charitable organisations. He has pledged to give at least half his total wealth to philanthropy. Gates is truly setting the bar for what can be done in one’s older age, never resting on past accomplishments, and continuing to strive to better the world. When it comes to the future, nothing is certain but by looking at current trends and analysing the current state of play, a fairly nuanced picture of what the future holds for over 60s can be drawn. 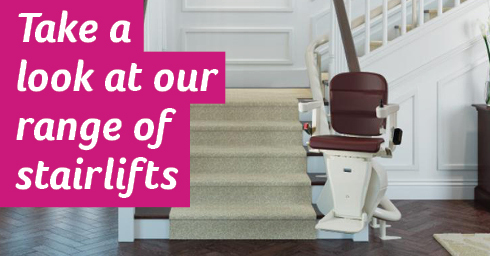 From accessibility for those in need of stairlifts to how over 60s will react to new technology, the future is exciting and will hopefully be a bright one for the next generation of older people.